To load/save BASIC files (*.bas) is working. Sorry, it doesn't work for me, tested with the Family BASIC V3. Maybe my old Notebook (Windows XP SP3 32-bit) is too slow for this program (Java 8). No problems to load/save tape files with Nestopia, VirtuaNES, nester, kindred, vdmgr and eFamilyBASIC. Can you upload a saved/working *.tape file to check I am able to load it or not? I started putting together an FAQ. Below are some entries related to the Data Recorder. Please let me know if they help you get it going. Thanks. How do I save a BASIC program to the Data Recorder? The SAVE command writes a BASIC program to a cassette tape. To save to a file called, "TEST", type in the following, but do not hit Return. Start the Data Recorder by selecting Machine | Family BASIC | Record Tape and now hit Return. Next, select Machine | Family BASIC | Stop Tape. Finally, select Machine | Family BASIC | Save Tape... to store the tape data to an actual file. Record Tape actually simulates rewinding the tape back to the beginning before recording. Consequentially, only one file can be stored on the virtual cassette tape. Also, Family BASIC limits file names to 16 characters. How do I load a BASIC program from the Data Recorder? If the tape data is in an actual file, select Machine | Family BASIC | Load Tape... to retrieve it. Select Machine | Family BASIC | Play Tape. A loading message will appear followed by OK. Finally, stop the Data Recorder via Machine | Family BASIC | Stop Tape. Can other games use the Data Recorder? Yes. Castle Excellent, Excitebike, Mach Rider and Wrecking Crew can use the Data Recorder to save tracks or stages created by players. Be sure to select Record Tape to start the Data Recorder before selecting save in the game. And, select Play Tape after selecting load in the game. "To save to a file called, "xxxx", type in the following, but do not hit Return." Is it possible to start Nintaco with the preferable speed set? Because "Normal" is too slow for me. I can add that feature. You use faster speeds for BASIC programs? You use faster speeds for BASIC programs? No, general to use Nintaco on older PC with WinXP. I think Arkanoid II and Lode Runner support the Data Recorder too. The menu on Lode Runner is only visible if the keyboard is available. Yep I can confirm that both games supports the tape recorder. Though Lode Runner requires detecting the keyboard, like AnnaWu said, and this doesn't work properly in some emulators like Nestopia. 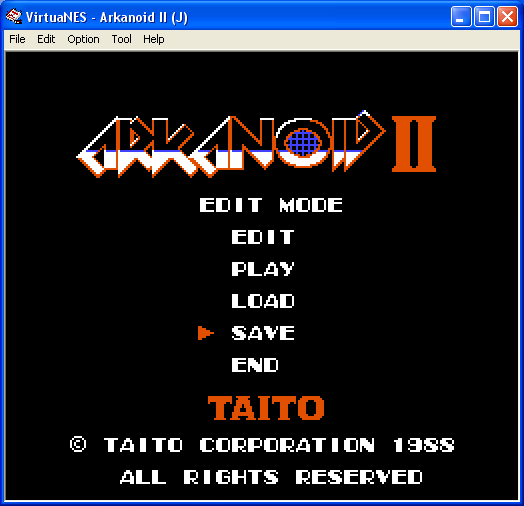 Also Arkanoid II seems very picky as I couldn't load my level properly on my real Famicom and Family Keyboard. Saving worked but when I loaded it from tape it turned out scrambled. It doesn't seem to work in Nestopia either. Though Lode Runner requires detecting the keyboard, like AnnaWu said, and this doesn't work properly in some emulators like Nestopia. It woks on VirtuaNES, kindred and vdmgr. Nintaco is not super optimized. It favors modern machines. The speed options do not compensate for slower boxes, unfortunately. Cool. I'll play around with these and update the FAQ accordingly. We should also update the wiki. Also Arkanoid II seems very picky as I couldn't load my level properly on my real Famicom and Family Keyboard. Saving worked but when I loaded it from tape it turned out scrambled. It doesn't seem to work in Nestopia either. It seems with kindred (emulator) can I LOAD/SAVE/PLAY the edited level in EDIT MODE. With all other emulators ( VirtuaNES, vdmgr,...) I have a problem with "LOAD" too. The saved level (*.wav) with vdmgr is working on kindred. 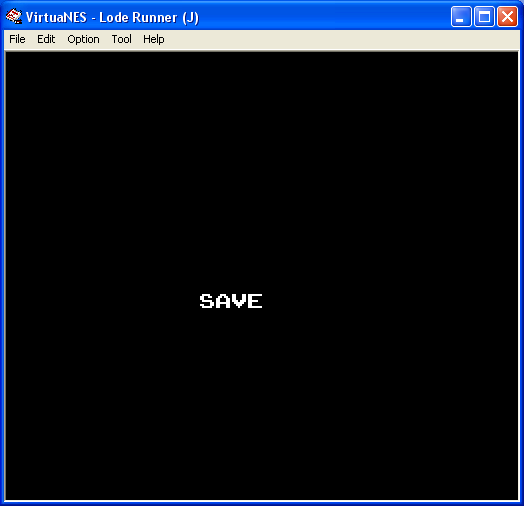 In Nintaco, I am able to save edited Arkanoid II levels with the Data Recorder; however, with Lode Runner, I can't get the save/load menu to appear even when the Keyboard and Data Recorder are attached. Does that work in any emulator? however, with Lode Runner, I can't get the save/load menu to appear even when the Keyboard and Data Recorder are attached. Does that work in any emulator? Yes, with vdmgr or kindred as example. Tested on vdmgr and kindred. Big thanks goes to the Japanese vdmgr programmer. He fixed the load/save problem with Arkanoid II. The waveform logic was reversed. I'll explore vdmgr and kindred to try to figure out why Lode Runner under Nintaco is not detecting the Keyboard. Unfortunately, vdmgr and kindred are not open source. Maybe you could figure out how Lode Runner is detecting the keyboard. If successful it could be added to the wiki for other emulator authors to get it to work as well.